Beautifully designed Enclosure Cards and Envelopes from the collection of C.E. Falls - "Home to the Worlds Most Beautiful Enclosure Cards" ™ . Click here to view our New Falls Catalog in flipbook form. Click here to view our New Falls Catalog as a pdf file. 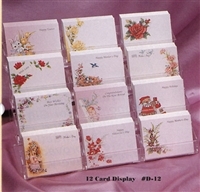 Dozens of floral and special occasion scenes available! Click on the product category from the menu at the top of this page or from the title links below. Size : 3 ½" X 2 ¾"
Size : 4 ½" X 2 7.8"
#2194 Self-Inking Stamp - 0.75" x 1 7/8"
Six Slot Card Display Case #2194 Multi-Color Self-Inking Stamp - 0.75" x 1 7/8"
#6025 Self-Inking Stamp - 2 3/16" x 1 1/4"